Entrance Hall with flagstone floor. Cloakroom: hand basin & WC, built in cupboard. Kitchen/Breakfast Room: Lovely spacious double length room which has underfloor heating and has a fitted cream kitchen at one end and a dining area at the other end. The kitchen is well-equipped with an electric oven, halogen hob, microwave, large fridge/freezer and integral Siemens dishwasher and washer/dryer. There is a breakfast bar with 3 painted stools. At the far end is the dining area with French doors to the garden, a dining table & 6 chairs, a wall-mounted TV and a sideboard with an i-pod dock and a selection of games. Sitting Room: Tastefully furnished with a large sofa, a snuggler chair and an armchair. 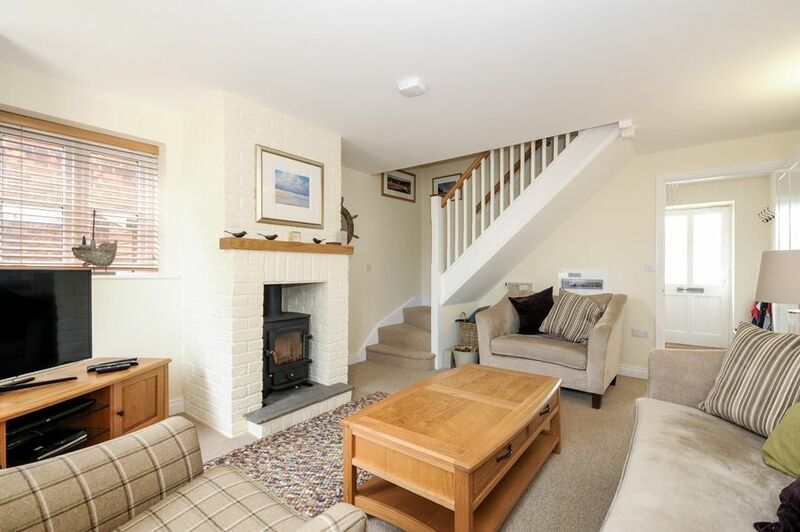 There is a painted brick fireplace with a wood-burning stove, freeview digital TV and DVD player. There are French doors opening out onto the garden. The stairs lead up from here. All the bedrooms are beautifully presented with good quality mattresses, fluffy towels and bed linen from The White Company and Sanderson. There is a choice of either luxurious down duvets and pillows, or non-allergenic ones if preferred. Bedroom 1: Overlooks the garden and has a king-size bed, bedside tables and lamps, small wardrobe with shelves and a wall-mounted TV. Ensuite shower room: with walk in shower, heated towel rail, hand basin & WC. Bedroom 2: Overlooks the garden and has a king-size bed, bedside tables and lamps and a large wardrobe. Bedroom 3: Charming room with a single bed with a truckle bed stored underneath, making this perfect for one adult or for 2 children. There's a bedside table and lamp, chair and wardrobe.